Clockwise, frae tap left: US combat operations in Ia Drang, ARVN Rangers defendin Saigon during the 1968 Tet Offensive, twa Douglas A-4C Skyhawks enroute for airstrikes against North Vietnam efter the Gulf o Tonkin incident, ARVN recaptur Quảng Trị during the 1972 Easter Offensive, ceevilians fleein the 1972 Battle o Quảng Trị, burial o 300 victims o the 1968 Huế Massacre. Unification o North an Sooth Vietnam intae the Socialist Republic o Vietnam. ** This figure includes aw o the dead frae the Laotian an Cambodian ceevil wars. 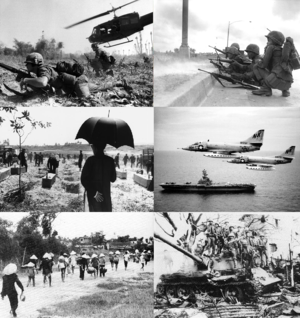 The Vietnam War (Vietnamese: Chiến tranh Việt Nam, in Vietnam an aa kent as the American War, Vietnamese: Chiến tranh Mỹ, Kháng chiến chống Mỹ), an aa kent as the Seicont Indocheenae War, wis a Cauld War-era proxy war that occurred in Vietnam, Laos, an Cambodia frae December 1956[A 1] tae the faw o Saigon on 30 Aprile 1975. This war follaed the First Indocheenae War an wis foucht atween North Vietnam—supportit bi Cheenae an ither communist allies—an the govrenment o Sooth Vietnam—supportit bi the Unitit States an ither anti-communist kintras. The Viet Cong (an aa kent as the Naitional Liberation Front, or NLF), a lichtly airmed Sooth Vietnamese communist common front directit bi the North, foucht a guerrilla war against anti-communist forces in the region. The Fowk's Airmy o Vietnam (a.k.a. the North Vietnamese Airmy) engaged in a mair conventional war, at times committin lairge units intae battle. U.S. an Sooth Vietnamese forces relied on air superiority an owerwhelmin firepouer tae conduct search an destroy operations, involvin grund forces, artillery, an airstrikes. ↑ 1.0 1.1 Due tae the early presence o American truips in Vietnam the stairt date o the Vietnam War is a matter o debate. In 1998 efter a heich level review bi the Department o Defense (DoD) an through the efforts o Richard B. Fitzgibbon's faimily the stairt date o the Vietnam War accordin tae the US govrenment wis offeecially chynged tae 1 November 1955. U.S. govrenment reports currently cite 1 November 1955 as the commencement date o the "Vietnam Conflict", acause this wis the day when the U.S. Militar Assistance Advisory Group (MAAG) in Indocheenae (deployed tae Sootheast Asie unner preses Truman) wis reorganized intae kintra-specific units an MAAG Vietnam wis established. Ither stairt dates include when Hanoi authorized Viet Cong forces in Sooth Vietnam tae begin a law-level insurgency in December 1956, whauras some view 26 September 1959 when the first battle occurred atween the Communist an Sooth Vietnamese army, as the stairt date. ↑ 1.0 1.1 1.2 1.3 1.4 1.5 1.6 "ALLIES OF THE REPUBLIC OF VIETNAM". Retrieved 24 September 2011. ↑ Larsen, Stanley R. and Collins, James L. Jr. Vietnam Studies: Allied Participation in Vietnam. Washington, D.C.: Department of the Army, 1985. p. 167. Spain sent a medical team to Co Gong Province in 1965. ↑ Vietnam Marines 1965–73. Osprey Publishing. 8 March 1965. Retrieved 29 April 2011. ↑ Spencer Tucker, Encyclopedia of the Vietnam War: A Political, Social, and Military History, ABC-CLIO, 1998, p 770. "At war's end in 1975, the PAVN numbered nearly 1 million troops, despite the loss..."
↑ 15.0 15.1 Reuters (16 May 1989). "China admits 320,000 troops fought in Vietnam". Toledo Blade. Retrieved 24 December 2013. ↑ 16.0 16.1 16.2 Lewy 1978, pp. 450–3. ↑ Lawrence 2009, pp. 65, 107, 154, 217. ↑ "Australian casualties in the Vietnam War, 1962–72 | Australian War Memorial". Awm.gov.au. Retrieved 2013-06-29. ↑ "Overview of the war in Vietnam | VietnamWar.govt.nz, New Zealand and the Vietnam War". Vietnamwar.govt.nz. 1965-07-16. Retrieved 2013-06-29. ↑ Shenon, Philip (23 April 1995). "20 Years After Victory, Vietnamese Communists Ponder How to Celebrate". The New York Times. Retrieved 24 February 2011. The Vietnamese government officially claimed a rough estimate of 2 million civilian deaths, but it did not divide these deaths between North and South Vietnam. ↑ Factasy. "The Vietnam War or Second Indochina War". PRLog. Retrieved 2013-06-29. This page wis last eeditit on 26 Dizember 2017, at 18:15.